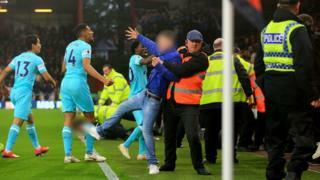 Five men have been charged with taking part in a pitch incursion during Saturday's match between AFC Bournemouth and Newcastle United. A female steward was injured during the encroachment by Newcastle supporters, police said. Four of the men are under investigation for allegedly assaulting her. All five suspects are due to appear before Poole magistrates on 2 April charged with going onto the playing area at a football match. Away fans spilled on to the pitch when Newcastle equalized in the 94th minute of Saturday's 2-2 Premier League draw. The steward suffered a nose injury and officers are trying to determine whether or not she was assaulted, Dorset Police said. The four men suspected of both assault and pitch incursion include a 29-year-old from Berwick-upon-Tweed, a 31-year-old from Alnwick and two men aged 18 and 40 from Newcastle. The fifth man charged is aged 24 and from Andover. A 14-year-old boy from Bournemouth who was arrested on suspicion of the pitch incursion has been released under investigation. An 18-year-old Durham man, arrested for the same offence, has been released without charge.